Who doesn't love a pink car, or pink sunglasses, or a silky pink blouse? Can you tell I have pink on the brain? I feel like every other month or so, I get on a big pink kick and wear everything pink in my closet. 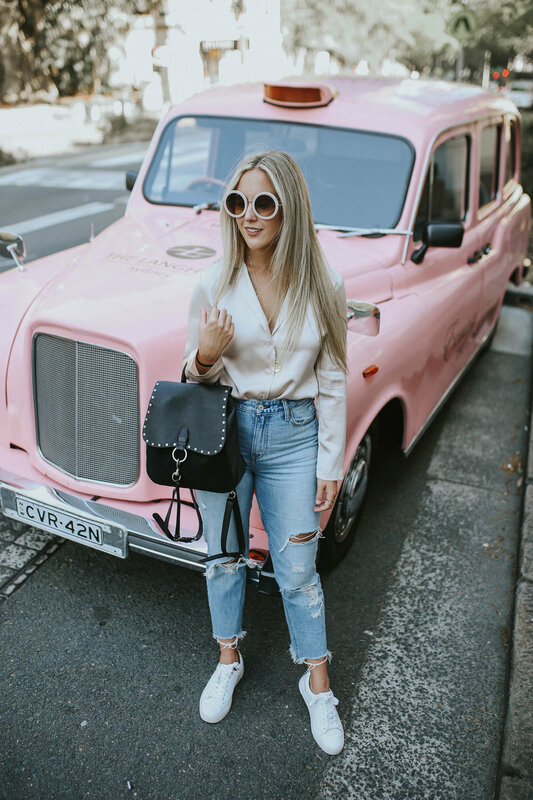 I shot this look in Australia and both Caroline and I screamed when we saw this pink car. It was the perfect accessory for my pink blouse and sunnies that I was wearing (fate?). This pink blouse from Amanda Uprichard has been a staple in my closet for Fall. I have worn it SO much and it literally pairs with everything. You can layer it underneath sweaters or blazers, wear it on its own with denim or tuck it into a fun skirt. Seriously, the possibilities are endless!